NovaGenix Anti Aging and Hormone Replacement. Specialists in TRT (Testosterone Replacement for men with Low T) and Hormone Therapy women with HRT for menoause, Platelet Rich Plasma, (PRP) and Stem Cell injections in Jupiter at 609 N Hepburn Ave. Jupiter FL 33458 for Chronic pain and injuries, Facial rejuvenation and Hair loss. ED PE treatments for men with erectile dysfunction (Cialis and Viagra) , weight loss and thyroid treatment in Palm Beach. CBS12 News Reporter Kara Duffy Visited NovaGenix in Jupiter, Florida To Learn About PRP Therapy and Stem Cell Treatments. Platelet Rich Plasma Injections Helped ProFighter and BJJ World Champion Herbert "The Blaze" Burns Heal From Knee Injuries In Time To Compete For Another World Title. Having treated hundreds of patients with platelet rich plasma including professional athletes, first responders, veterans and more... NovaGenix is the premier anti-aging and regenerative medicine clinic in South Florida. 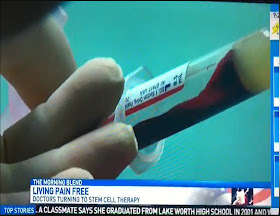 Recently in our Jupiter, Florida clinic, we were interviewed by CBS 12 news reporter Kara Duffy on the process and procedures involved with PRP therapy. It starts with drawing a small amount of a patient’s blood and concentrating the platelets. We can then inject them into the point of injury or chronic pain to help the body heal faster and more effectively. We can help patients heal faster so that they could continue competing without the need for surgical intervention and lengthy recovery. We’ve seen men and women well into their 70s and 80s recover from conditions like chronic back, hip or knee pain which had been preventing them from doing the things they enjoy like playing golf, walking on the beach with friends or just about any hobby you can think of.